Unlike criminal conduct at the state level, which varies from state to state, federal crimes have a similar process across the United States. The following sections will provide an overview of five key facets of the legal process for federal crimes. In most federal criminal cases, a grand jury convenes to review available evidence and determine whether probable cause exists. At the federal level, grand juries meet in a closed courtroom. The only people in attendance are the witness(es), federal prosecutor, court reporter, and jurors selected from the community. Grand jury meetings occur without the presence of a judge. After considering the evidence presented, the grand jury members vote on the issue of probable cause. If the grand jury determines that probable cause exists, they may issue formal criminal charges in writing, which is often referred to as an indictment. Verify whether the defendant can afford to pay for legal counsel. If the defendant cannot afford to pay for legal counsel, the magistrate judge will appoint an attorney to represent the defendant. After the initial appearance, a federal magistrate judge will decide whether the defendant qualifies for release on bail or detention. If the prosecution demonstrates that the defendant is a danger to the community or a flight risk, then the magistrate judge may authorize detention pending the trial result. If the magistrate judge decides to release the defendant, there are necessary stipulations. Although the individual circumstances of each case vary, the defendant is normally required to appear in court whenever summoned and remain in the jurisdiction. Within 10 to 20 days of the initial appearance, the defendant will appear in court for a preliminary hearing known as an arraignment. The arraignment serves as a formal charging process, with the prosecution reading the criminal charges in complete detail. At this point, a federal district court judge takes over for the magistrate judge. The district court judge presides over the arraignment and remaining steps in the defendant’s case, including pretrial motions, trial, and sentencing. In response to formal criminal charges, the defendant must enter a plea of either guilty or not guilty. The majority of federal criminal cases end at this point with a guilty plea. In many of those cases, the defendant can reduce their sentence by entering into a plea bargain with the prosecution. If the defendant pleads not guilty, however, the case will enter the trial phase. There are many stages in the trial phase, which can change based on the specifics facts of the case in question. If you are facing federal criminal charges in Virginia, it is wise to consult with a knowledgeable criminal defense attorney. 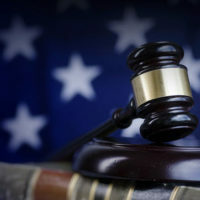 The attorneys at Simms Showers LLP, servicing Leesburg, Winchester, Fairfax, and Manassas, have helped many clients defend against criminal charges on the federal and state levels. If you need legal help with criminal defense, contact us today for a free initial consultation.